Packed with 10g of protein per 50g serving, they added peanut butter and roasted peanuts to our wholesome super grain blend for a deliciously healthy snack. Their "just-the-right-size" clusters make these perfect to be enjoyed in a bowl with milk, on top of a smoothie, or even by the handful. 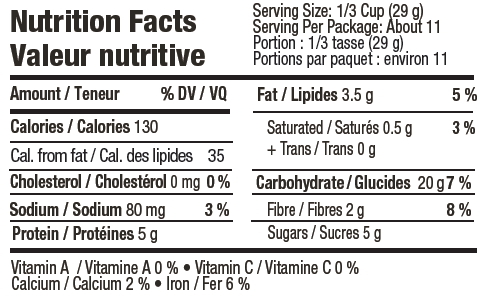 Ingredients: Whole grains (wheat free oats, brown rice, millet, buckwheat, amaranth, quinoa), evaporated cane juice, soy crisp (soy protein isolate, tapioca starch, calcium carbonate), peanut butter, peanut oil, tapioca syrup, peanuts, peanut flour, salt, natural vitamin E.
Delicious and lower in sugar then a lot of competitors. Love this product. Use it on my yoghurt every morning. Nice to order it online and get such prompt delivery. This product is delicious. I use it daily on my breakfast fruit and yoghurt mixture. It is yummy and not ridiculously high in calories. I went to a lot of effort to find this and order it on line since I cannot find it in any stores in my city in Canada. Pity. I will definitely order it online again and again! A little pricey. excellent granola, low sugar, low sodium, great added into Greek yogurt! Delicious but I thought they would be larger clusters so that they could be a snack for a toddler. Instead it is very small pieces (which you can't grab with fingers). Very tasty! Perfect on yogurt or by itself! Great nutty taste & texture. Satisfying snack in small handfuls. Not too sweet. Really good peanut butter taste. Good texture. Very delicious !! One of the best Ive tasted. This stuff tastes great! And I love using it as a cereal, just to munch on or with yogurt. Great for peanut butter addicts. Took one star off just because it is a bit pricey. 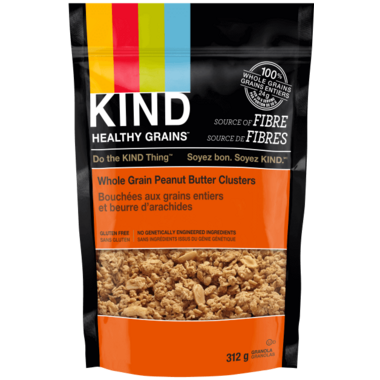 At first I was not sure I would like a peanut butter flavoured granola, but this Kind granola is actually quite good, and the bigger clusters are great for snacking. Tastes great in some yogurt too. I love this granola!! I pour some in a dish and just eat it as a snack. It has a great flavour and great crunch! Nice roasted taste. Perfect in yogurt or plain as a snack.